By Miriam Valverde on Wednesday, February 7th, 2018 at 1:57 p.m.
White House Chief of Staff John Kelly spoke to reporters on Feb. 6 about young immigrants eligible for the Obama-era deportation protection program, called Deferred Action for Childhood Arrivals, or DACA. Kelly said that while 690,000 immigrants who signed up for the program are protected by DACA, President Donald Trump put forth a plan to benefit many more people — 1.8 million. To be eligible, people must meet educational requirements, have no felony convictions, and have arrived in the United States as children. Kelly said "some would say" that among reasons why more eligible immigrants didn’t sign up for DACA were fear and laziness. Below are Kelly’s remarks, based on audio posted by the Washington Post. "You probably know this, that we were asked for the president’s perspective on taking care of the DACA issue. And he sent over what (inaudible) his four pillars. "I think the first part of that, which was stunning and no one expected it, was, there are 690,000 official DACA registrants. And the president sent over what amounts to be two and a half times that number, to 1.8 million. "The difference between 690 and 1.8 million were the people that some would say were too afraid to sign up, others would say were too lazy to get off their asses, but they didn’t sign up. "So the president shockingly said, ‘Okay 1.8 million,’ and then probably the biggest shock was, and a path to citizenship. That’s beyond what anyone could have imagined, whether you are on the right or the left. And then on top of that, kind of the third tier of that, is that anyone, any of the family members based on the chain, so-called chain or family reunification, that anyone in the chain or in the pipeline, 4 million roughly, will be allowed to continue through the pipeline. The pipeline will just end. "So that’s kind of the first leg of this whole stool. The second one, of course, would be the elimination of chain migration, or family reunification, some would call it. But again, after the 4 million that are in the pipeline move through, and then of course the issue of doing away with the lottery system and then finally the interior enforcement. I shouldn’t say finally. The wall system that the president talks about, and that would be in some places, in many places, as the president has said, many times, as back as 2015." 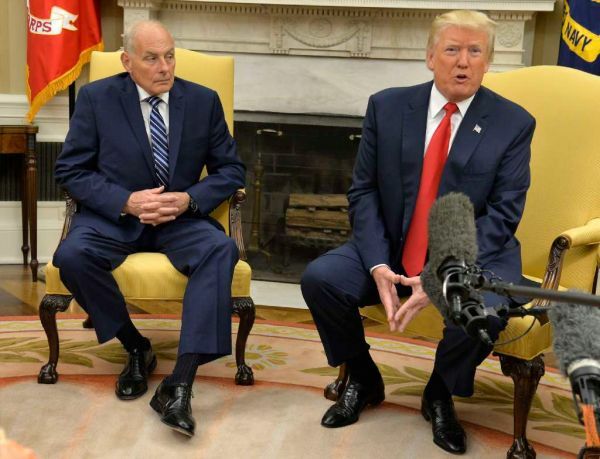 Media outlets reported that Kelly later in the day was asked to clarify his statements, and he doubled down on the sentiment. Below are Kelly’s additional comments, based on video posted by ABC News. "Some of them didn't hear about the program. Hard to believe, but okay. Some of them were perhaps a little bit concerned about signing up when many, many people in their neighborhood signed up three times, two or three times. But okay, fine." "But I've got to tell you, the rest of them who are now claiming, not even claiming, have been granted essentially DACA status by the President of the United States, who has become the champion, I believe, for 1.8 million people who are now considered kind of DACA. "I've got to say that some of them just should have probably gotten off the couch and signed up, but that doesn't really matter now, because President Trump has given them the status."